Is your brand washing away the competition? Even if your brand is resonating with consumers right now, you want to keep an eye on the competitive landscape, adjust to changing consumer expectations, and make sure you stay #1, all while moving at the speed of business today. To give you an example of brand research in action, SurveyMonkey Audience measured the brand performance of top shampoo brands. 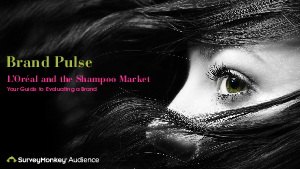 Download this sample Brand Pulse tracking study on top shampoo brands to see the insights and analysis you could be bringing to your business.